Companies today are like bewildered heroes beset on all sides by the titans of Facebook, twitter, blogging, and Youtube. They think to themselves that they have held out for a long time and that they have fought the good fight. However, now comes the time where many corporations must choose to either ignore, embrace, or vanquish the dragon of social networking….. This moment of decision is a lot like the beginning of the trials of Sisyphus…. Sisyphus was a king cursed by the gods to roll a heavy stone up a great mountain every day… only to see it roll back again… day after day. Most experienced leaders will know that many times the promise of “new and change” just bring about more of the “same”….. Social networking is the like the rolling stone that will either brings destruction or a shining future….. the wheel of progress turns steadily and it grinds ceaselessly forward…. 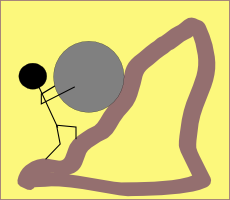 Sisyphus never rests…. his task is to roll the stone up the mountain with full knowledge that it will roll down always… and that he will again have to toil the burden up the hill again and again…. this is the price of progress…. this is the price of creative destruction.